Ethno-progressive-psychedelic rock from three brothers in Wisconson. Who would have thought? These guys really gel and flow and move well with each other as the 7 different musical pieces take you to different places. While the bio says the new material is more complex than previous releases, it is not overly so. Joe is an accomplished guitar player, while brother William plays all the basses, sitar and keyboards and Paul plays the drums. A few times the keyboards were a bit too new age sounding for me, but overall it reminds me the most of RUSH. I am not sure why but it does. "The Divine Art Of Flying" features some nice sitar, not trying to show off, just playing a nice melody for the bass and guitars to layer upon. "Sleqet’s Kiss" is a progressive rock workout number with some really fantastic cool bass lines and sounds. If you like to hear really excellent and interesting bass playing this is a great CD to check out. "Creations Brief Gift" is a good demonstration. "Temptation’s Screaming Ground" is probably the heaviest track on the CD and the only one I would even remotely consider to have a heavy metal guitar, as has been written in other reviews. The CD closes with "Departure". Not as heavy as I had expected and incredible playing, especially the bass. 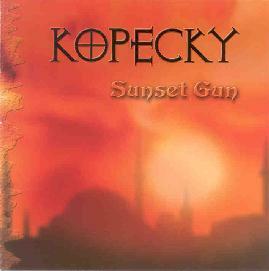 For more information you can visit the Kopecky web site at: http://www.kopecky.8m.com. Sunset Gun is distributed by Musea Records. You can visit their web site at: http://www.musearecords.com.